Elvis Aaron Presley (January 8, 1935 – August 16, 1977) – an American singer, musician and actor. 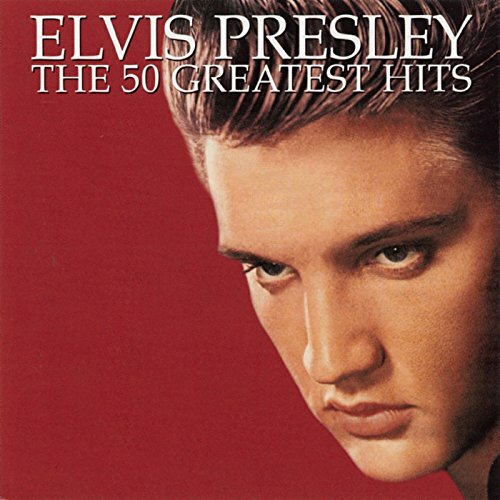 Elvis Presley became one of the most influential cultural icons of a generation. He is commonly referred to as the “The King of Rock ‘n’ Roll” and epitomises the post-war pop generation. Elvis was born in Tupelo, Mississippi. When he was 13, his family moved to Memphis, Tennessee. Elvis was relatively shy and as a youngster was not keen on performing in public. However, he received a guitar as a present and learnt to play and sing; he gained no formal musical training, but had an innate natural talent and could easily pick up music. As a teenager, he was uninterested in school – but become absorbed in music, listening to a huge range of contemporary American music. He also started to sport a distinctive look with sideburns and styled hair. This image would later become an ‘Elvis’ trademark. In 1953, he went to Sun recording studio – to record a song for his mother, but also with the hope he may get noticed and offered a recording deal. However, it didn’t come to anything; he was also turned down for auditions to other groups. In April 1954, he took a job as a truck driver. However, later on in the year, the Sun boss Sam Phillips invited Elvis to come in for a recording session. 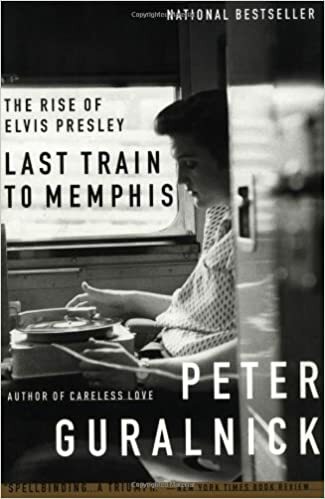 Initially, the recording session was unpromising, but towards the end of the allotted time, Elvis started to play a song he had composed himself. Phillips was immediately impressed by the verve, enthusiasm and dynamism of Elvis’s music. 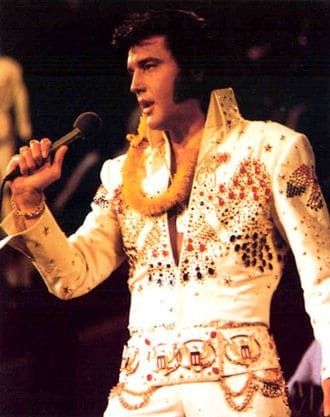 Phillips believed that Elvis had a unique voice and talent which could capture the interest of Americans. For his first studio recording, Elvis performed the 1946 blues number, Arthur Crudup’s “That’s All Right”; it was well received on local radio stations. This initial success launched Presley into a lucrative pop music career. 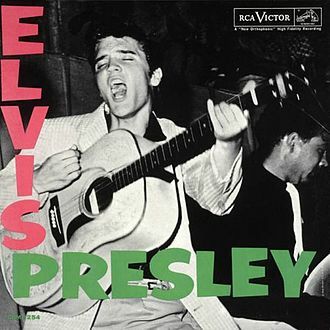 In January 1956, Presley was signed by RCA Records. His first single, “Heartbreak Hotel“, was released in January and became a best-selling hit – staying at number one for seven weeks, and selling over one million copies. 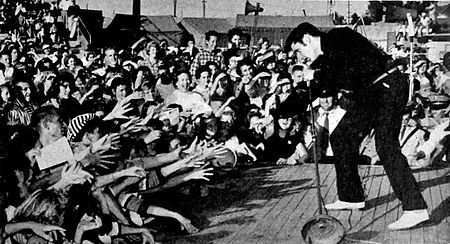 However, if Presley was considered a controversial and a rebellious figure, it just made him more popular with young listeners. His catapult to stardom was helped by a rivalry between TV presenters, such as Steve Allen and Ed Sullivan. Elvis proved a star attraction on tv talk shows, and the competition between presenters helped to make Elvis a national celebrity. It also helped bring rock ‘n’ roll into the mainstream. John Lennon, of the Beatles, described the effect that Elvis had on his musical development. Ironically, Elvis was never keen to meet the Beatles and when they did meet on one occasion – 27 August 1965 – it was a mutual disappointment. But, Lennon always maintained without Elvis, there would have been no Beatles. At live concerts, his crowds increasingly became overly exuberant. When Presley began playing hits like “You ain’t nothin’ but a Hound Dog” the crowd would go wild. This led Presley to take a break from live performances. In 1958-60, Presley was called up for national service in the American army. He was stationed in Germany and served in the regular army, and was keen to be seen as an ordinary soldier doing his duty. He could have signed up for Special Services, which would have enabled him to perform live music, but he preferred to stay in the regular army. During his stay in Freiburg, Germany he met Priscilla Beaulieu, who he would marry after a seven-year courtship. They married in 1967 and, in 1968, Priscilla gave birth to Elvis’s only child – Lisa Marie. After the stint in the army, he began to focus more on movies. Presley made several movies in the 1960s. These were generally received with low critical acclaim, though they were quite popular and commercially successful. By the end of the 1960s, Presley’s career was in decline. He had become known for formulaic films and uninspiring soundtracks. He was increasingly unhappy with the direction of his career. In 1967, Presley made a comeback as a singer, but his first eight singles were mostly flops and failed to make an impression on the pop charts. The exception was the 1969 single “If I Can Dream”, which helped to reinvigorate Presley’s musical creativity. In 1970, he released “The Wonder of You” which topped the charts in the UK and US. He also began a new music tour, which sold out to record-breaking crowds. However, from 1973, Presley began to increasingly suffer health problems – related to his obesity and drug dependency. He continued to try and maintain a hectic touring schedule, but his performances were negatively affected by his obvious health problems. In 1976, aged only 42, he died from multiple causes; fourteen different drugs were found in his bloodstream. His early death only cemented his legendary status, and Elvis Presley has become deeply ingrained in popular culture. Presley’s home Graceland was opened to the public in the 1980s and attracts over half a million visitors annually. It was declared a National Historic Landmark in 2006. Citation: Pettinger, Tejvan. “Biography of Elvis Presley”, Oxford, UK. www.biographyonline.net, 1st Jan. 2013. Updated 10th January 2018.